This is a sponsored post for the RJI Fellowship. Apply for a Fellowship by January 31, 2018. Journalism fellowships are great opportunities for established journalists both to gain a professional support system and to grow as professionals by working on new, innovative projects. 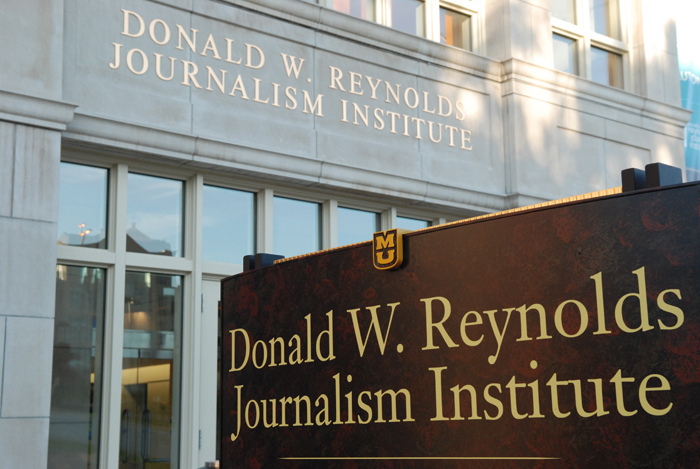 The Donald W. Reynolds Journalism Institute is currently accepting proposals from individuals and organizations who want to develop projects that can better journalism. RJI offers three options: residential fellowships, during which Fellows live and work in Columbia, Mo., for 8 months; non-residential fellowships which allow Fellows to work remotely; and institutional Fellowships that allow people to continue to work in their workplace. Fellows get stipends that range from $20,000 up to $80,000 for the year. The Institute wants to tackle big problems and offer big opportunities with practical approaches, RJI Associate Director Mike McKean explained. He said applications should describe projects that can be completed, or see substantial, measurable process, within a year’s time. The Fellowships are competitive, with RJI typically receiving a couple hundred applications. We spoke to several Fellows from years past to see what advice they have for prospective candidates interested in applying for the 2018-2019 class. Connor Sheets is an investigative reporter at AL.com. As part of his 2016-2017 Fellowship, he created techniques to help members of local, Alabama communities pitch stories they believe should be covered in the news. “I knew that I was ready to apply for a fellowship because I saw a clear need – namely that many small and local newsrooms would benefit from a simple, inexpensive way to keep better tabs on their communities – and knew that I had an interesting idea about how to help address it,” Sheets said. 2) Be passionate about your project. Sheets also said his application was made stronger by the fact that he was passionate about his proposed tool, and had an idea of how to bring it to fruition. Conrad Jungmann, who led an institutional fellowship for LION Digital Media in 2014-2015, said RJI recognizes projects that have both merit and passion. He advises that prospective applicants stay true to their own journalistic mission. “If you believe your project will have an impact on journalism and/or the business of journalism, make sure your application shows it,” he said. 3) Be clear in your application. The more thoroughly researched and clearly written an application is, the better the likelihood it will be accepted. Linda Austin, an editor and educator who is a 2017-2018 Fellow, advises that applicants do their homework before applying. They should research what’s already been done and how their idea is different. “In addition to demonstrating commitment, that research will result in a stronger application,” she said. Another piece of advice from Austin: Have a trusted colleague look over the application before submitting it. Sometimes a fresh set of eyes can identify key points that are missing from a proposal. Barrett Golding, a web developer and executive producer of NPR’s Hearing Voices, created a suite of open-source WordPress plugins designed for use by journalists during his 2015-2016 Fellowship. He said that during the interview process, applicants are asked tough questions, which gives them more opportunities to expand on their written proposals. “Show them on your application what you want to do, why it’s worth doing, and why you’re the one to do it,” Golding said. RJI will understand what candidates are proposing if they propose it understandably, he said. Sheets said his biggest piece of advice is to just go for it. When he applied for the Fellowship, he felt like he didn’t fit the profile of someone who might be awarded a fellowship as prestigious as RJI’s. But he believes that the strength of his proposal, combined with his passion, is what moved RJI to choose him for the Fellowship that year. Cohn echoed Sheets’ sentiments – there are zero reasons not to apply, and interested candidates who don’t apply will regret it. And Austin has advice for individuals whose proposals are not accepted, too. She recommends those applicants ask why they weren’t accepted, because they may get advice that could refashion the proposal to make it stronger. She also said it’s worth investigating multiple funding options for a project. “If you believe in an idea, don’t give up,” she said. For even more advice, read our story from last year about how past Fellows succeed. The deadline to apply to the 2018-2019 class of Fellows is Jan. 31, 2018 so be sure to apply today!.